Focus RS in nitrous blue looks absolutely stunning. Someone on Detailing World has just taken delivery of one. I'd rather have that to an A45 and save a bit of money. i wont say as its his glory to show, but its at detailers as we speak having proper paint protection done, looks lovely in Grey. Prob start seeing them on the road now, he got it very early. Last edited by Littleted; 04 May 2016 at 10:57 AM. I've got a nitrous on order, still no build date though. Hoping to have it by end of July. 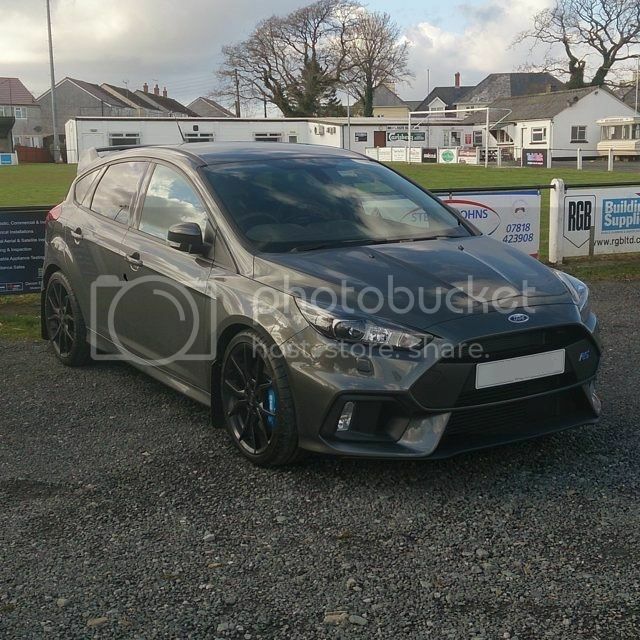 Nitrous Blue Focus RS (sorry, LSharrat's post referred to the colour so it seemed relevant). Saw a NB one earlier, after work. With colour-coded brake calipers. Nice. EDIT: The calipers were as per below! Last edited by joz8968; 05 May 2016 at 01:37 PM. Very nice... personally I think it needs to be the light blue for this car, but colour is a very personal and subjective thing. Enjoy! Lovely Norman, how are you finding it? I'm too old for the blue prefer stealth at my age as it doesn't get the attention and racer boys wanting to race me off the lights. Most people don't even know what it is and I prefer that at my age but yes if you want to flaunt it in people's faces go for the Nitrous Blue although there are reports of paint problems with the colour . It's only been in my hands for a few days currently having the Black Serum treatment due back on Friday. I love the Focus ST for its value for money and this just goes one better. The shell seats are great value too. We are all awaiting the Mountune Performance upgrade which is a superb product for keeping your warranty and is normally recognised by insurance companies as a 'standard' car rather than a modification so you don't get shafted! I think it is fantastic for Ford to make such a great product and they work well with Mountune like the good old Prodrive days. Yeah, hoping for MP400 but I think MP375 or MP380 is more realistic. I've gone for shell seats too, had originally selected the standard ones but after sitting back to back I concluded the 'tight' fit of the standard chairs would actually wear thin after a while - besides, the CS seats look soooo much better. I still haven't sussed a technique for getting in and out of the seats yet it's looking like a return to the Lotus technique of sliding back every time as the steering wheel gets in the way and the bolsters are so high! When is yours coming Saxo Boy mine wasn't due until October? Still got running 4-month projection (i.e. meaningless). I'm a J-order but a late one as I placed order on 7th October just before pre-order cut-off. Really hoping to have it by mid-July but I fear it'll be mid-late August, possibly September. Do they also offer the darker Performance Blue, that Liquid Blue, (or similar hues) for this MY RS? Last edited by joz8968; 05 May 2016 at 01:42 PM. No, that was for show only. Well I pick up a new A45 next week, went for black. I might be getting shot of mine now. Just banged it back to standard in readiness.